Your personal experience will be the pudding in this post, as you test out the research reported in this Science News article, The bright side of sadness. Buddha thought we needed only to rely on our personal experience to know the truth of life, including his Noble Truths. No ‘take my word for it’ hoodwinking here. The advanced capabilities of modern science just give us a lot more to chew on. This article has a good deal of meat… such as, “Bad moods can have unappreciated mental upsides“. It looks to me like we’re slowly getting closer to a healthier balanced view of nature. Amen. I’m unsure how long the link to this Science News report will be viable, so I’ll quote some and comment here and there. “Bad moods are seen in our happiness-focused culture as representing a problem, but we need to be aware that temporary, mild negative feelings have important benefits,” Forgas says. Growing evidence suggests that gloomy moods improve key types of thinking and behavior, Forgas asserts in a new review paper aptly titled “Don’t worry, be sad!” For good evolutionary reasons, positive and negative moods subtly recruit thinking styles suited to either benign or troubling situations, he says. Each way of dealing with current circumstances generally works well, if imperfectly. New and recent studies described by Forgas in the June Current Directions in Psychological Science illustrate some of the ways in which periods of sadness spontaneously recruit a detail-oriented, analytical thinking style. Morose moods have evolved as early-warning signs of problematic or dangerous situations that demand close attention, these reports suggest. Different moods may trigger distinct thinking styles that allow people to respond appropriately to whatever situation they find themselves in, scientists speculate. There are likely benefits, and costs, to each thinking style. One investigation found that people in sad moods have an advantage remembering the details of unusual incidents that they have witnessed. And a little gloominess could help job applicants; lousy moods cut down on the tendency to stereotype others, thus boosting the accuracy of first impressions. People in sad moods also show a greater willingness to work on demanding tasks, communicate more persuasively and are more concerned with being fair to others than are peers in neutral or happy moods. Alternatively, good moods trigger a loose mode of thought conducive to creativity and seeing the big picture. Happiness signals that a situation is safe, or at least not immediately threatening, Forgas suggests. As a result, people in a cheery state have the luxury of focusing on themselves rather than on their environments. Whether good or bad, moods are relatively low-intensity, background feelings that can last for anywhere from a few minutes to the whole day. A person may feel somewhat good or bad, happy or sad, without knowing why or even being aware of such moods. Sad moods fall far short of clinical depression’s constant feelings of helplessness and hopelessness. But moods linger much longer than emotions, which typically flare up and burn out fairly quickly. In contrast to a mood, joy, anger and disgust feel intense and are experienced as having definite causes. First, saying that moods “can last for anywhere from a few minutes to the whole day”, is not the whole story. Looking back, I see an overall mood that lasted for the first forty years of my life. Then, riding on top that baseline mood were short-term fluctuations that this research addresses. From the descriptions given here, I’d say that I suffered from a long-term “good mood”. The value of this research illuminates potential problems arising from too much “happiness” and “good mood”. “Happiness signals that a situation is safe” helps explain much of my first forty years. I’ve never felt much fear, at least of the cognitive kind. The visceral kind is another matter. When shot at once in Vietnam, with bullets whizzing by, I naturally pissed my pants. Fortunately, most of life lacks that sort of intense autonomic stimulus, and lacking imagination-induced fear, it was easy to travel the world as I did for as long as I did. I recall a period in my 30’s when I seriously longed to feel compassion. This is odd when I think about it. How do you miss something you don’t seem to have? Perhaps my long-term baseline mood was shifting toward the sadder end of the spectrum. Was I feeling compassionate about my lacking sufficient compassion? Then, in the early 80’s, right after completing correlations, I finally experience what I assumed was depression. Ever since then, I experience sadness at least half the time, with a full helping of compassion to go with it. This research sheds light on the connection. Sometimes I look back on the time I longed to feel compassion, and appreciate the depth of sadness I am now able to experience. This report, speaking to the positive side of negativity, tells me why I appreciate my downer moods. Note: You’ll get lost if you get up too close and think over details, as per chapter 71’s, Realizing I don’t’ know is better; not knowing this knowing is disease. The spiral graphic (above) I drew for my thesis on correlations may be more confusing than helpful. Then again, perhaps a little confusion can help the mind get ‘outside its box’. For more, see this PDF of that page. Bear in mind that the correlations process only introduces the initial approach. 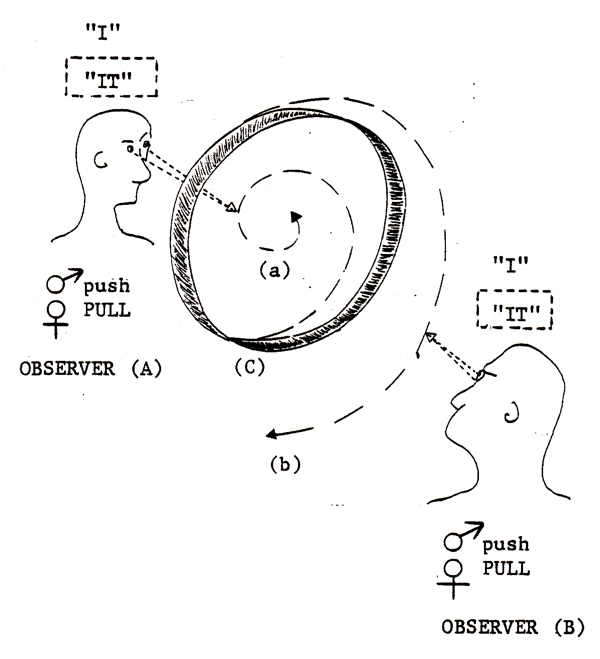 It is the observations that it can evoke that are either bizarre or mind-blowing. On which side of the spiral am I? A few decades ago, uncertainty arose over which side of the happy/sad fence I was experiencing. I seem to feel both at the same time. Is this is a result of aging? I mean, this much aging is something I’ve never experienced before either. Youth naturally feels – and thus sees – life more black and white. Experience slowly teaches us otherwise, to some degree anyway. One thing is apparent; we don’t get to choose our moods! They choose us. My emotional shift toward sadness in the early 80’s probably influenced my change of mind concerning free will. Before correlations, I was a 100% proponent of free will. Overall, I had too much happy good mood for my own holistic good. The onslaught of depression and sadness brought balance to my life (1). Individuals aren’t slaves to their moods, Schwarz cautions. A sad person can think outside the box if necessary, say, to solve problems at work. And a happy person can accurately fill out tax forms or complete other detail-heavy tasks. Evidence from many labs supports Schwarz’s view that moods inform people’s judgments, often advantageously and outside of awareness, psychologist Rainer Greifeneder of the University of Basel in Switzerland and his colleagues reported in the May 2011 Personality and Social Psychology Review. I like to think of this “outside of awareness” as being the rest of the iceberg. The tip is what we think we know, as my often quoted chapter 71 alludes to, Realizing I don’t know is better; not knowing this knowing is disease. The problem with ‘awareness’ is that it dominates consciousness. I should say, ‘thinking awareness’. Objectively identifying the powerful influence of the more primal parts of our nature enhances self-understanding, but I suppose only if one is in the mood to acknowledge and accept it. “In natural situations, feelings provide mostly valid information about whether there is a problem or not and how to respond to current tasks,” Schwarz says. “Negative moods direct attention to tasks at hand and promote analytical thinking, whereas positive moods broaden attention and prompt original thinking. Forgas sees no need for a special field of research to study “negative psychology.” He would settle for “more awareness that negative feelings are so common and widespread that they must have adaptive functions.” Reports of specific ways in which sadness benefits thinking are beginning to accumulate. I suppose saying negative feelings “must have adaptive functions” is coming from a narrow survival-of-the-fittest point of view. Nature is much more subtle, to paraphrase chapter 1, ‘The nature possible to express runs counter to the constant nature‘. As I see it, nature wastes nothing; everything has a purpose, even if that purpose is nothing. Much of nature’s process clearly goes against what we personally desire. Self-interest dictates how we think life ‘should be’. And to prove it, we righteously claim truth is on our side. It is fine to want what we want; let us just be honest about it. On the other hand, Of ancients adept in the way, none ever use it to enlighten people, They will use it in order to fool them. Still, there is the other side, When intelligence increases, there is great falseness. Either way is natural, I have to admit. It is just not what I want! This is a clear example of my moral indignation being a projection — a symptom — of what I want, or deeper down, fear. (See symptoms point of view) Realizing this symptomatic side of thought helps counteract thought’s ‘disease’ side of the coin. Sadness also confers some surprising social benefits. “While a positive mood may increase self-focus and selfishness, a negative mood can increase concern for others and the quality of communication,” Forgas says. I’d go a step further and say that emotions, happy or sad, not only “influence thinking styles”, they cause them. We are how we feel; we think from within how we feel. To put it in Descartes-ese, “I feel therefore I think the way I think”. This research just helps demonstrate this. But moods may not engage specific mental strategies as proposed by Forgas, says psychologist Jeffrey Huntsinger of Loyola University Chicago. Several recent investigations, described by Huntsinger in the August Current Directions in Psychological Science, suggest that positive moods prompt individuals to double down on any current thinking style, while negative moods trigger a shift to an alternative thinking style. Among neutral-mood volunteers focusing broadly on an experimental task, those induced to be happy thought even more expansively about the task, whereas those prodded into sadness switched to concentrating on details. When already in a detail-oriented frame of mind, volunteers who became happy maintained that perspective, while those who became sad moved to a broad focus. If these findings hold up, happy and sad moods simply signal whether or not to change one’s current thinking style, Huntsinger says, rather than indicating whether to adopt an analytical or playful thinking style. 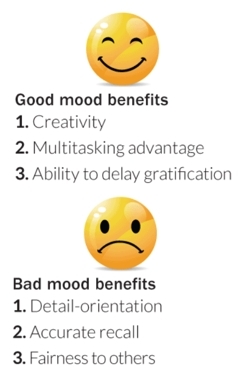 Researchers have yet to test which of these two possibilities best explains mood-related behaviors. Forgas acknowledges that much remains unknown about precisely how moods influence thought. If moods work as Huntsinger suggests and not as orchestrators of specific thinking styles, Forgas says, it won’t get him down. Not that there would be anything wrong with that. Related to sad moods, I have noticed an increased cognitive commitment to details in the practices I’ve done for most of my life, i.e., yoga, tai chi, and blowing Zen. I always thought this was due to increasing maturity. It still could be, but I suspect now this increased focus is also due to the onset of a more baseline sadness into my life my play a big role. When life gets serious, you take it more seriously. Finally, I see hints of the researchers running into the free-will wall. While all the biological, sociological, and zoological evidence points away from free will, I find the researchers have a hard time accepting the evidence’s full implications. Of course, no one can prove free will doesn’t exist, but we could acknowledge the lack of evidence for it! I mean, we could if we had free will! 😉 No, I’m afraid the myth of explicit free will is a cornerstone of our American paradigm. It goes deeper than that, however. The Western belief in free will is merely an offshoot of a universal implied sense of free will that has haunted humanity ever since our species’ ability to think evolved. All this then is just the natural result of emotions driving thought. It is always interesting to see us dancing around that issue. It reminds me of Hans Christian Andersen’s, The Emperor’s New Suit (the Emperor had no cloths, but…). (1) My correlations project only lasted six months, albeit, six months of 24/7. The shift of my baseline mood to a ‘darker side’ was rather sudden, but a core free will paradigm persisted for another decade. Only gradually did I begin to doubt it, and look for evidence. I found none that a simpler process couldn’t explain. The simplest and most elegant process I found was this : the strongest need or fear ‘chooses’ the course all animals (including humans) take in life. That brought Buddha’s Four Truths into deeper focus. Now, evidence for the Truths was easy to find… all too easy! It appears that waking up to reality is a slow, life long process despite flashes of insight along the way. You could say, enlightenment is both gradual and sudden.